Whether it is for personal fulfillment or commercial purposes, many seek to know the secret of viral tweets. Viral tweets boost awareness, sales, and social media campaigns. Every marketer and business owner dreams of creating viral tweets which spread across the internet like wildfire. However, for tweets to go viral, they must be shareable. So, the question you should be asking yourself is not “How do I create a viral tweet?” Rather, it should be, “How do I make my tweets more shareable?” Use these Twitter marketing tips to start creating shareable tweets. Your username (or handle) on Twitter is your identity. Therefore, you must choose one that reflects your brand or business. This way, when people search for your company, they will easily find your profile. If you choose a username that is not related to your brand, people won’t find you easily. They will end up following other companies and you could lose business. Remember that Twitter displays similar handles in search; if people don’t find you, they will follow those with similar usernames. If you only have five followers, it will be next to impossible for your tweets to attain viral status. Having fewer followers also makes you “unpopular” on Twitter because a Twitter profile is rated depending on its follower base. Therefore, the few followers will make people ignore your posts. Start following people in your industry. When you follow them, they will most likely follow you back. And don’t stop there, share their posts as well. When you share other people’s posts, they are motivated to share yours. Once you have many followers, it won’t be hard to get more. Your followers will make your posts to spread. What type of content are you sharing on Twitter? You can never build a loyal community if you constantly share irrelevant information. Always share timely, relevant, and informative content. Answer questions and respond to comments. You can also post links to other people’s content. Keep in mind that if you share the type of content your audience loves, you will not only build a strong community, you will boost your credibility. Your followers will start seeing you as a guru and you won’t have to tell them to share your tweets. Hashtags are everywhere these days: On Twitter, Facebook, Google+, and even Pinterest. People use them to create instant connections with other users while brands use them to engage with their customers. On twitter, hashtags are used to track trending topics or specific keywords. Hashtags are a vital part of Twitter marketing. Tweets with hashtags get twice the engagement than those without. Therefore, whenever you create a tweet, be sure to use hashtags. However, use no more than 2 hashtags per tweet. When you use too many hashtags, you’ll be seen as a spammer. Twitter users usually narrow down their searches using hashtags and will most likely see your tweets if they contain the keywords they searched for. If they like your tweets, they will most likely retweet them. Since Twitter is widely used by mobile owners, it can be difficult to pinpoint the best time to post. However, research shows that people tend to tweet more on Thursday, Friday, Saturday, and Sunday than any other day of sthe week. In addition, retweets are usually highest around 5pm. Twitter conducted a study on mobile users (who make up a large part of twitter users) and found that they are usually on the site during their commute and during work and school hours. What does this mean? It means that you should time your tweets. Make sure you tweet when more people are online to increase the chances of your tweets being shared. People will not notice your tweets, let alone share them if you do not use catchy words. Use words and phrases that capture attention. For example, you can say “This is a must-have product” instead of “This product is useful.” Remember that words help you to talk about your service or product with flair. Use words that evoke vivid mental pictures and allow your followers to fantasize about what their lives could be like if they used your products or services. Steer clear of overused clichés and generic descriptions. If you use phrases that have been used time and again, your tweets won’t have the crucial necessity of stop-ability. If your tweets are valuable, ask your followers to share them to ensure they are widely read. But don’t ask for retweets all the time, people will get tired of doing it and stop. Ask for retweets after every 4-5 tweets on different days. As well, retweet other people’s tweets. If you retweet another person’s content, you will stand out among all the clutter that is on Twitter. Build a relationship with your followers and they’ll find it easy to fulfill your requests. Companies often reward their loyal clients with gifts and services. Follow suit. When you make your followers feel special and appreciated, you turn them into brand ambassadors. People follow their favorite brands on Twitter to learn more about them, to become a part of their communities, to get freebies, and to discover new products. Give freebies from time to time and always let your followers know you are grateful for them. Twitter cards allow you to display information beyond the allowed 140 characters. You can combine a link, title, and image all in a single tweet. The cards allow your audience to sign up for your email list or to download your new app directly from a tweet without ever leaving the platform. Tweets that have these cards are more visible and attractive and are more likely to be shared. They enable you to offer your followers a rich media experience. Tweets with images are more likely to be shared than any other tweets. While there are many ways to upload images to Twitter, those uploaded to pic.twitter.com have greater chances of being retweeted. Tweets that use Facebook or Instagram images are less likely to be retweeted. When uploading images, ensure you use Twitter’s native uploading system. 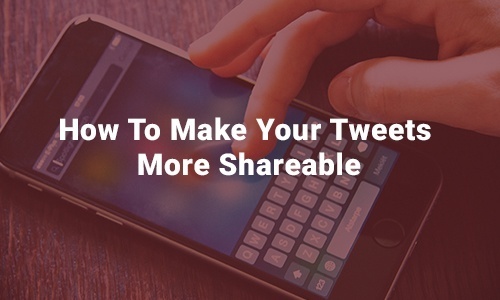 Making your posts more shareable on Twitter is not as hard as it seems. You only need to know what to share, who to target, and how to be unique so that you stand out from the millions of tweets on the platform. Implement these strategies, and your posts will spread like a flash. You will never have to worry about your tweets not getting shared.